My goodness this looks absolutely wonderful. Studio Ghibli has unveiled a trailer for the animated movie The Red Turtle, which they collaborated on during the storyboard and development phase (animation was finished mostly in France). 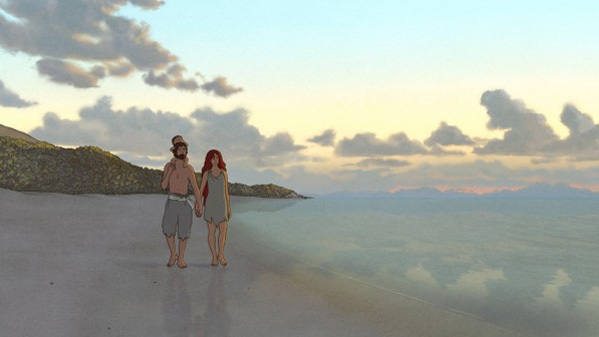 Directed by Dutch filmmaker Michael Dudok de Wit, the animated movie is entirely dialogue free and tells the story of a man stuck on a desert island who encounters a mysterious red turtle that always thwarts his attempts to leave. This trailer shows quite a bit, but not too much, as this is the kind of film you should save for seeing in theaters when it's released. The Red Turtle premieres at the Cannes Film Festival and I'll be seeing the very first showing. Catch this trailer in the meantime. Have fun. The description for The Red Turtle calls it a "fantastical tale" about a "man marooned on a desert island whose attempts to escape on a raft are thwarted by a giant turtle that sinks the makeshift craft." Dutch filmmaker Michael Dudok de Wit is directing and co-wrote the screenplay with French director Pascale Ferran, best known for Lady Chatterley and Bird People. As exciting as it is knowing that Studio Ghibli is involved, this isn't exactly a "new Ghibli movie". The original reports (via Kotaku) stated that Dudok de Wit temporarily relocated to Tokyo to finish the story and storyboards, with Ghibli's Isao Takahta overseeing everything. However, the film was finished being animated in France, not in Japan. It first premieres at the Cannes Film Festival next week, and doesn't have any US release date set yet. Stay tuned for more updates. I like the look of it. Will it have the Ghibli magic? "The Black Stallion" came to mind. And Malick. The Black Stallion is one of my 'desert island films' for sure. Pun intended. This one looks gorgeous and can't wait. Wow! It has Japanese animation with French eyes! You're one of the ONLY outlets reporting this story properly. Every major outlet is all "Ghibli is back", presenting this like Ghibli is returning to features, and in some cases erasing Michael Dudok de Wit from the narrative. Thank for for having some integrity.